..qui si parla principalmente di netlabels e musica libera..
[EN] Lenovo M30-70: the first thing to do? 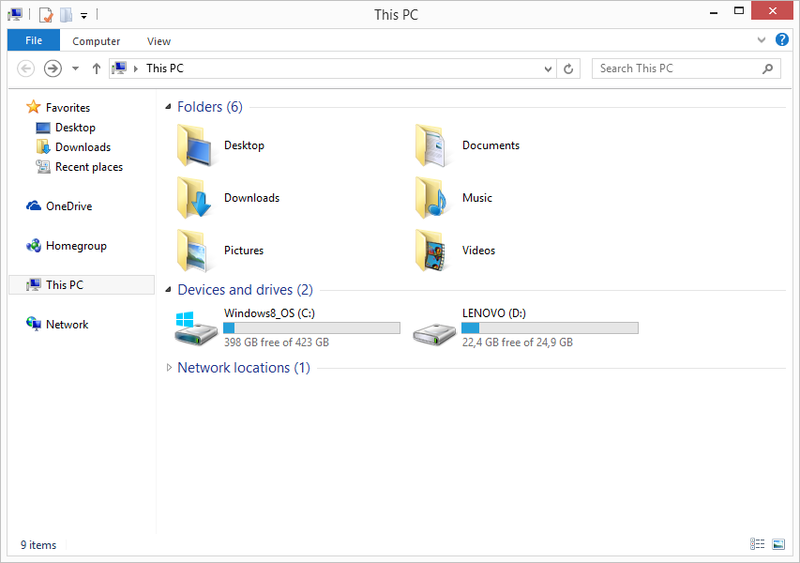 Get rid of Windows 8.1! I don’t think I’m the only one out there who thinks that Windows 8.1 is crap, do I? In my opinion, Windows 8.1 is a totally confusing and misconceived operating system, but I think that also Microsoft has the same opinion as I do, since they rolled back a lot of things in the new Windows 10. Anyway, my shiny Lenovo M30-70 shipped with a licensed copy of Windows 8.1. Before getting rid of it, and installing whatever else operating system you wish, it’s a good practice to create a recovery disk on an usb pendrive. Since you paied for the OS, and you could need that license in the future (ex. to reinstall it before selling it, to upgrade to Windows 10 for free…), it’s -warmly- recommended that you backup it. Do it as soon as possible. In my case, Windows 8.1 run for like 20 minutes before I started the procedure, that you can find here. Be aware that you’ll need a pendrive with a size of at least 16 gb, and the recovery disk will take approximately 12 Gb of it. 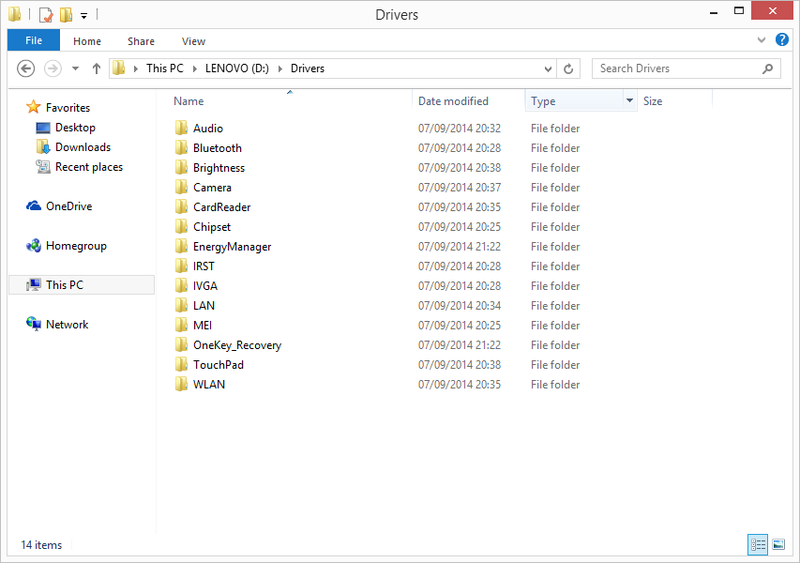 It could be a good idea to backup D: as well, since it contains all the drivers in one place, as I wrote here. As I was writing some days ago, I recently bought a Lenovo M30-70. I used Lenovo enterprise laptops for years at work, but this is the first time I own one. Once booted, I’ve been really positively impressed by one thing on the software-side. Lenovo provides to you an extra partition with all the drivers inside. I dreamed about something like this for ages in my fifteen+ years of experience as IT technician for private customers. Everytime I had to prepare a machine, I had to deal with the manufacturers’ crappy websites in order to dowload the drivers, copy them on an external drive, install them on the target machine, how frustrating! Lot of time wasted for such a simple thing, expecially in the pre-DSL era. Now finally big computer brands have started to address this issue! Thumb up for Lenovo! If you live in Sweden since a while and you own a personnummer, you’ve surely heard about the possibility to go to school and learn Swedish for free. All the people around you mention quite often the word “SFI”, that stays for “Swedish for Immigrants” (Svenska för Invandrare), but a very small percentage of them knows that SFI is just the first step in a full learning path, about which there are not clear information in English on the Internet (neither on Swedish actually…). Or well, there were not…until now. After many hours spent researching on-line, and asking in the Komvux of my little town, I finally understood how everything exactly works, and I´m glad to share everything with you in English, so that you can effectively plan your studying and boost your Swedish skills, that are quite nice to have if you live in this land. The Swedish learning path for foreigners conceived by Skolverket (Swedish National Agency of Education) is quite smart and well planned, but it needs a lot of effort by your side and a couple of years if you want to reach some results. The path I will describe in this post is the one valid at the moment of writing, year 2014-2015. Imagine it like a videogame, with a serie of achievements to reach in order to unlock the next ones. I don’t usually buy gadgets on swedish e-commerce websites, because the prices are quite higher than ordering on Amazon or eBay (or than buying them when I go back to Italy), but a couple of weeks ago I decided to give them a try, since I needed a laptop with quite a lot of urgency. After maniacally stalking Priskakt for a couple of weeks, I decided to buy my new laptop on NetOnNet, one of the biggest websites available in Sweden regarding computers and peripherals. Ordering and payment processes have been as expected, it’s a reputable website after all, so I would go for it again if needed. The only little “complain” is about their handling time. It took almost three days for them to ship the package from their warehouse (placed in Börås), and after that less the two days to reach my hands (using the free, slow shipping included in the price, not the fast one for 79 kr). Being habit to Amazon or eBay sellers who ship the package the next morning, or the same day, a package handling time of almost three days looks quite anachronistic to me. My order was made of just a laptop and a pendrive, both in stock and available. Quick opinion: Lenovo M30-70 (Scandinavian version). Cheapest ultrabook (and cheapest 13.3′ laptop) on the market when I bought it (under 300$, end of January 2015). The laptop ships with Windows 8.1, but Lenovo is very nice and provides the drivers for Windows 7 as well, it’s the only brand that does that for a consumer computer. Excellent support for Linux. The two power plugs that you see in the videos are the german plug and the danish plug (three poles). The plastics feel a bit cheap, but ok for the price. The screen is matte (yay!). It feels very light and compact (price apart, it’s the main reason to buy it for). First boot takes appr. 3 minutes (I edited the video). You are currently browsing the il blog di eldino blog archives for febbraio 2015. Di cosa parla questo blog? "il blog di eldino" è un blog ragionato e tecnico in italiano che parla principalmente di netlabels, musica gratuita su licenza Creative Commons e alternartive sostenibili al copyright tradizionale. L'Autore, su questi argomenti, ha inoltre tenuto un workshop al Festival della Creatività (Firenze - Fortezza da Basso, ottobre 2007), ha partecipato ad alcune trasmissioni radiofoniche (Radio Incontro, 2008) e ha relazionato in alcuni Linux Day. L'Autore è molto attivo nella scena netaudio internazionale ed alcuni articoli in inglese sono stati proposti anche su queste pagine. La prolificità musicale nella scena netlabel: un fenomeno che ne intacca la qualità? [EN/IT] DAAP! DA..what?? / DAAP! DA..che cosa?? [IT] Netlabels & FLAC: tanta musica gratuita in formato lossless! [IT] Ikea Hacking: come creare un monitor stand con 10 euro!